Publication Date: 26th September 2017. It's Leigh. I don't think I need another reason to justify why I want to read this. 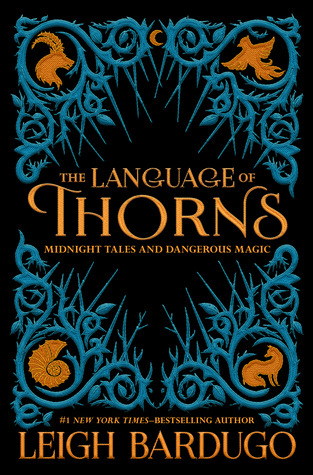 Anyone else excited for The Language of Thorns?! Oh! I just featured this one last week and I'm also excited for it! Yay cool! Hope we both love it! Very excited for this one too! Love the cover! Yaaaasss, I am looking forward to reading the full book! The sampler was such a tease. :D I hope you enjoy this book when you get the chance to read it! Ooooh I haven't read the sampler! I still haven't read anything by Leigh Bardugo, but I hope to soon! I hope you love this one! Ah you must!! She's amazing! I'm afraid I haven't enjoyed this author's work but I hope you love it! Sorry to hear that :( But thanks! Oh that is so awesome! Can't wait for you review! I'm looking forward to this one too. And her Wonder Woman book. I haven't gotten my hands on that on yet. We jut got Internet access, so now I'm trying to catch up with comment replies, comments back, and blog posts! This is an EXCITING, AMAZING pick you have here, hands down!! I already have this book on my GR shelves; one look at the cover, and I was like, GIVE IT TO ME NOW!! Lol. But, of course, the GREAT plot summary helped, too!! Leigh Bardugo is a MAJOR talent!! Oh no Maria, that's hectic! And please don't apologise!! That excuse is EXTREMELY valid! I'm glad you weren't hit by those winds, though. Yikes. Yay, so glad you love the look of it too!! And yeah, Bardugo is SKILL! !